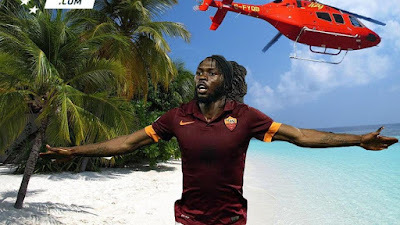 Former Arsenal forward Gervinho was clearly desperate not to join Abu Dhabi side Al Jazira – or else he just really wanted his own private beach and helicopter. The 28-year-old managed to scupper a move to the Middle East outfit by reportedly making some outrageous demands. According to Italian newspaper Gazzetta dello Sport, Gervinho’s "obscene demands" were so high that the deal collapsed under the weight of his requests. The paper reported that Roma and Al Jazira reached an agreement over a €13million (£9.25m) transfer - only for the player’s wish list to bring it to a screeching halt. The Ivorian, who has impressed for Roma over the last two seasons in Serie A, has been repeatedly linked with a move away from Italy over the summer.